Nigeria’s top candidates on Saturday condemned the surprise last-minute decision to delay the presidential election for a week until Feb. 23, blaming each other but appealing to Africa’s largest democracy for calm. The decision, announced five hours before polls were to open, is a costly one, with analysts at SBM Intelligence estimating an economic hit of $2 billion, plus a blow to the country’s reputation. Authorities now must decide what to do with already delivered voting materials in a tense atmosphere where some electoral facilities in recent days have been torched. If the vote had continued as planned, polling units could not have opened at the same time nationwide. “This is very important to public perceptions of elections as free, fair and credible,” Yakubu said, adding that as late as 2 a.m. they were still confident the election could go ahead. The new Feb. 23 election date is “without equivocation” final, he said. Bitter voters in the capital, Abuja, and elsewhere who traveled home to cast their ballots, including from Nigeria’s vast diaspora, said they could not afford to wait another seven days, and warned that election apathy could follow. Some anguished over rescheduling weddings, exams and other milestones. 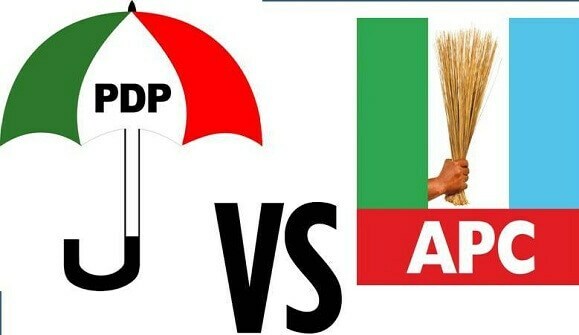 The party backing top opposition challenger Atiku Abubakar accused President Muhammadu Buhari’s administration of “instigating this postponement” with the aim of ensuring a low turnout. It urged Nigerians to turn out in greater numbers a week from now. “You can postpone an election, but you cannot postpone destiny,” Abubakar tweeted. Buhari said he was “deeply disappointed” after the electoral commission had “given assurances, day after day and almost hour after hour that they are in complete readiness for the elections.” His statement appealed for calm and asserted that his administration does not interfere in the commission’s work. A spokesman for the president’s campaign committee, Festus Keyamo, accused Abubakar’s party of causing the delay to try to slow Buhari’s momentum. A civic group monitoring the election, the Situation Room, blasted the “needless tension and confusion” and called on political parties to avoid incitement and misinformation. Nigeria’s more than 190 million people anticipate a close race between Buhari and Abubakar, a billionaire former vice president. Both have pledged to work for a peaceful election even as supporters, including high-level officials, have caused alarm with warnings against foreign interference and allegations of rigging. When Buhari came to power in 2015 — after a six-week election delay blamed on extremist insecurity — he made Nigerian history with the first defeat of an incumbent president. The vote was hailed as one of the most transparent and untroubled ever in Africa’s most populous country, which has seen deadly post-election violence in the past.